The leading newspaper in Bangladesh, the Daily Star, found that the page used to incite the attack had no links to the boy. The Additional District Magistrate to the jurisdriction stated that no one had found any substance to the claim made against the schoolboy. The US Embassy expressed its "deep concern" about the recent attacks on Hindus and urged the Bangladeshi government to take action against the criminals and protect the rights of minorities. Hundreds of Islamists recently stormed 26 homes belonging to minority Hindus in the Bangladeshi sub-district Santhia, and more in other areas. On the morning of November 2, 2013, a group of Islamists began distributing photocopies of what they claimed was a "Facebook page." They accused a Hindu boy, Razib Saha, who was preparing for a Secondary School Certificate examination, of demeaning the Prophet Mohammad on that page. An hour after distributing the photocopies, the Islamists caught the father of Razib Saha at his shop and beat him. They then attacked and vandalized houses in the Hindu neighborhood, destroyed two shrines, damaged several idols and forced 150 families to flee the area. Meanwhile, protesting against the supposed defamation of the prophet Mohammad, for five hours people from different villages blockaded the highway that runs through the area. The leading newspaper in Bangladesh, the Daily Star, found that the page used to incite the attack had no links to the boy. The Additional District Magistrate of the jurisdiction stated that no one found any substance to the claim made against the schoolboy. In another incident, a group of masked criminals attacked 18 shops belonging to members of the Hindu community in a rural area in the district Lalmonirhat. The attack was allegedly launched by the main opposition party, BNP, and its crucial ally, Bangladesh Jammat-e Islami, the largest Islamist political party. The US Embassy expressed its deep concern at the recent attacks on Hindus in both the areas and urged the Bangladeshi government to take action against the criminals and protect the rights of minorities. Transparency International Bangladesh, a body of the Berlin-based Transparency International, also expressed its deep concern about seven incidents that have taken place over the last few days. It said, "Onslaughts and intimidation on minorities for ill and destructive political purpose before the election are not acceptable." 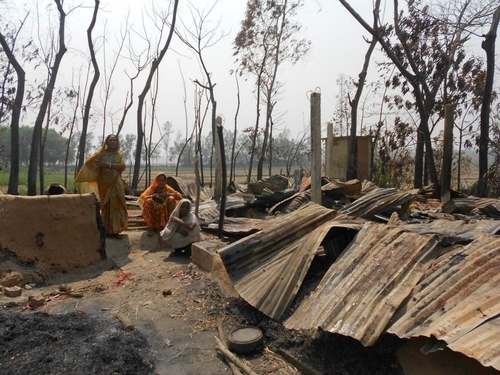 According to Hindu community leaders, so far, more than 50 Hindu temples and more than 1,500 Hindu homes were destroyed in 20 districts in 2013 alone. Community leaders claimed that the Jihadi groups responsible for these attacks are funded by Hefajat-e-Islam, Jamaat-e-Islam and BNP. The president of the Bangladesh Hindu Buddhist Christian Unity Council said, "Conspirators are out to create a situation so that the Hindus can be attacked." There is a commoniy cited statistic that the Hindus of the country are roughly 8.5% of the population, but since 2001, the Hindu minority population of the country is noticeably vanishing. They have, however, been supporting the Bangladesh Awami League, the party that led country's liberation struggle in 1971 against Pakistani occupation, and the leading party of the current alliance government. The Awami League maintains good ties with India, a predominately Hindu country. The Party is considered a secular one, likely not to the liking of the millions of fundamentalists of the country. Moreover, the government has initiated an International War Crimes Tribunal, in which nine members of the Jammat-e-Islami and two top BNP leaders have already been convicted for war crimes, and sentenced to life in prison or death. The country is currently in deep political turmoil on the issue of election, scheduled for January 24, 2014. It is a threatening situation for minorities, with the country's Islamists repeatedly using the Quran and the name of the Prophet Mohammad as tools to incite the massive and combustible Muslim community. In the last year, an estimated 25,000 Islamists attacked 12 Buddhist temples and monasteries and 50 homes in reaction to the alleged tagging of an image, supposedly depicted as a "desecration of Quran," in the Facebook profile of a young man. Subsequently, several Hindu temples were destroyed and the violence spread.